Hi there friends! I trust you are having a fabulous day!!! It's a little warm here in Montana, but the air is nice and crisp in the mornings. You can see a hint of color in the trees and you know that fall is definitely in the air! 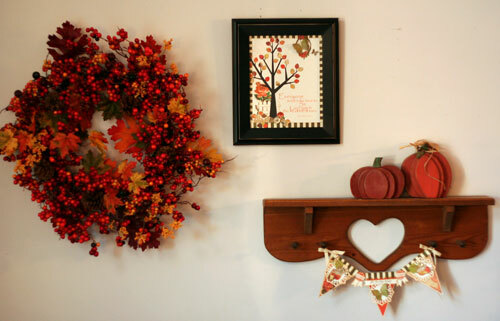 This weekend I couldn't help but pull out all my fall decorations. It seemed, however that my collection was missing a few things. I don't know what I did with them, but I was motivated to grab my Glitz Design Laced with Grace papers and make some new decorations to brighten up my walls! I played with the quote using Photoshop Elements and the Papyrus font and I really like the way it turned out. 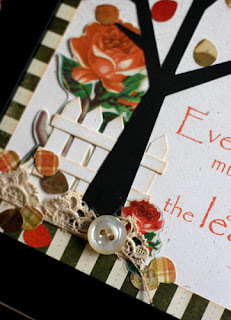 I spritzed the background paper with Tattered Angels Coffee Shop Glimmer Mist to add some warmth to the rustic cream cardstock. I found the frame at Michael's for 40% off and I cut the tree trunk out of the backside of Love Games Floral paper to match the frame. 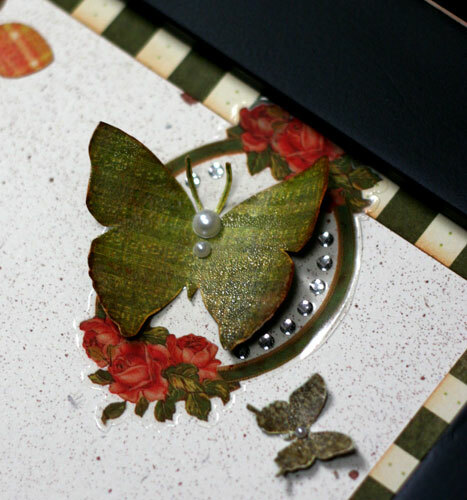 I cut the butterflies out of the Laced with Grace Butterflies paper and coated them with Tim Holtz Rock Candy Distress Crackle Paint. The crackle paint added lots of texture and a little shine. I took some tea dye distress ink and worked it into the cracks and crevices of the crackle paint and then I added some pearls to each of them. I cut the tree out at 8 3/4 inches and I used several Laced with Grace Papers for the leaves. I added Laced with Grace Whatnots and Glitzers to finish out the scene. 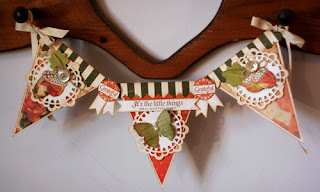 I cut out three pennants and covered them with Laced with Grace Papers and added a striped border to each of them. I carried over the crackled butterfly to add some uniformity to my decorations. 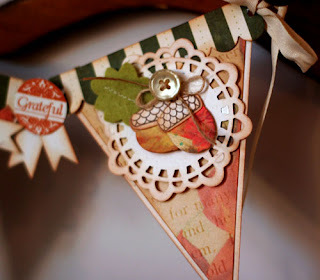 I cut out some sweet little doilies out of rustic cream paper to mount them on and inked them all with tea dye ink. 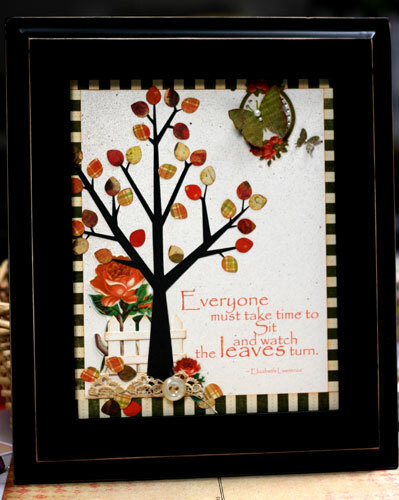 I added some stitched felt leaves and die cut acorns. 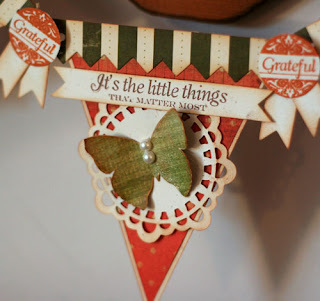 I just love the sentiment on the banner, "Its the little things that matter most", Isn't that so true? I found the wreath at Joann's fabrics to complete the ensemble. 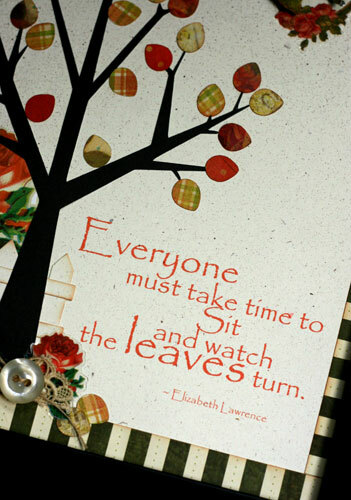 Ahhhh....the gloriousness of fall! All I needed was a little Glitz Design Magic!! other supplies: Papertrey Ink: Rustic Cream Cardstock, Autumn Acorns dies and stamps, Double-Edged Banner die, Gratitude Journal Stamps, Picket Fence Die, Banner Border Die, and Rustic Cream buttons and twine; Cricut Serenade Cartridge; Tattered Angels Coffee Shop Glimmer Mist; Tim Holtz Rock Candy Crackle Paint and Distress Tea Dye Ink; Recollections Pearls; Micheal's Frame. those are both awesome projects :) love them!